It's T minus two days until we move from our squalid little sublet and into a cozy new apartment with two (count 'em, two) decks and a working fireplace, and a marvelous kitchen that I cannot wait to christen. But as much as I'm looking forward to moving back across the river, I'll miss Cambridge's quirky atmosphere. (A few weeks ago—and I swear this is true—I saw a Buddhist monk going into an Urban Outfitters.) I'll miss walking through Harvard Yard every morning on my way to work, and I'll miss living within walking distance of Otto Pizza. 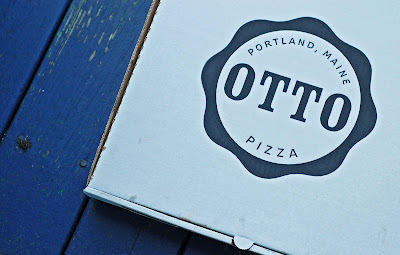 Otto started in Portland, Maine, but they have a recently-opened location in Cambridge. I can't believe that we went nearly the entire summer without the utter deliciousness that is Otto Pizza. It's a tiny (and I do mean tiny) little place in Harvard Square, which I must have passed, oh, about a bajillion times without even noticing. But I've been craving pizza like a fiend lately, so last week we gave their Three-Cheese Tortellini pizza a try, and people, it was stupendous. We gobbled the entire thing up in probably twenty minutes, and the next day I had to physically restrain myself from going to get another one. 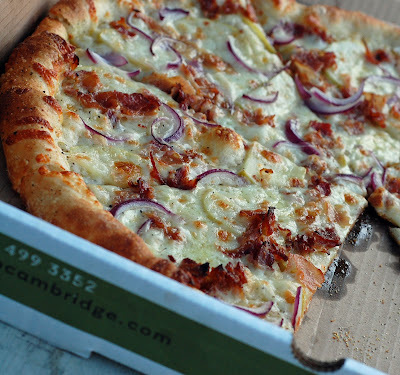 This is their Apple, Bacon, and Red Onion pizza. It's also quite good, but honestly, I fell in love with the amazing fresh red sauce on that tortellini pizza. I can't wait to go back and try more of their genius toppings, like Butternut Squash+Ricotta+Cranberry, or Pulled Pork+Mango, or Mashed Potato+Bacon+Scallion. I've already Google-Mapped the route between Otto and our future apartment. It's 18 minutes, and on a toll road to boot. But don't think that'll stop me. Ask if they'll deliver. They sound absolutely delicious pizza makes--of outstanding and unusual pizzas. All content, text, and images on this blog are protected by copyright and may not be used without specific, written prior permission.